Mother’s Day is coming up this Sunday. Don’t freak out or anything. I’m telling this to you now so you can get your act together with a couple of days to spare. My mom called Monday and sternly warned that under no uncertain terms, she would be very very upset with me if I sent her anything for Mother’s Day. She couldn’t see my furrowed brow and sideways scrunched mouth as I looked at the shipping receipt on my desk. Both she and my MIL are getting some amazing Helliemae’s caramels (jasmine and classic salt, if you must know). Hey, at least I listened to her sage advice on retirement accounts when I was 21. Last month, Courtney posted a photo on Facebook of a slice of cake she had gotten at a bakery. It was an almond pistachio cake with whipped cream and it looked incredibly good. I said as much and she confirmed my suspicions. I have a slight love affair/obsession with pistachios because they have such a beautiful flavor and they are green, which is the best color ever. So of course, I went looking about the interwebs for a good pistachio cake recipe. 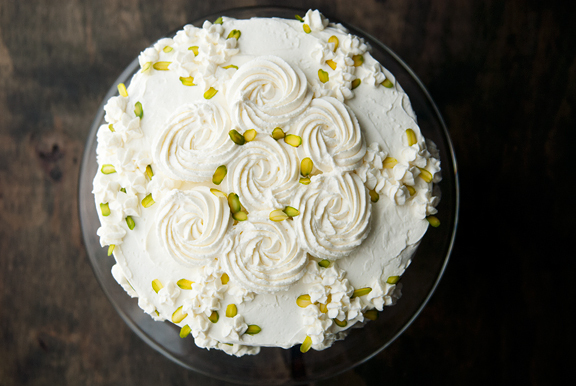 I died a little bit with every recipe that called for instant pistachio-flavored pudding mix, but eventually I did find one that appealed to me and I thought it fitting to post a cake before Mother’s Day in case you wanted to bake something special for Mom. Ultimately, I converged on the idea of two layers of pistachio cake and one layer of almond cake, all frosted with whipped cream. You are welcome to add jam layers, chocolate ganache, soaking syrups (mmm, amaretto soaking syrup! 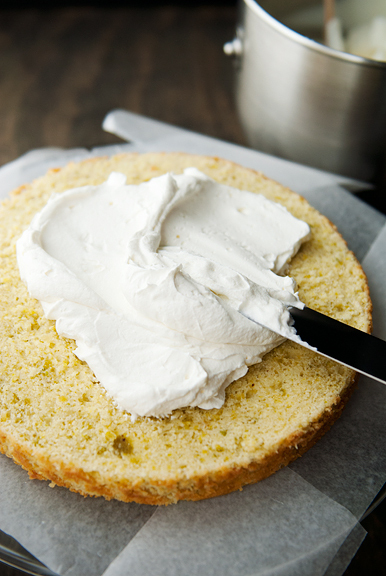 ), swap the whipped cream frosting out for buttercream frosting. The point is – make a cake that you (or Mom) will love. The first step for me was to make pistachio paste because I can’t source it easily and I was delighted to find a recipe for it on Ellie’s blog. 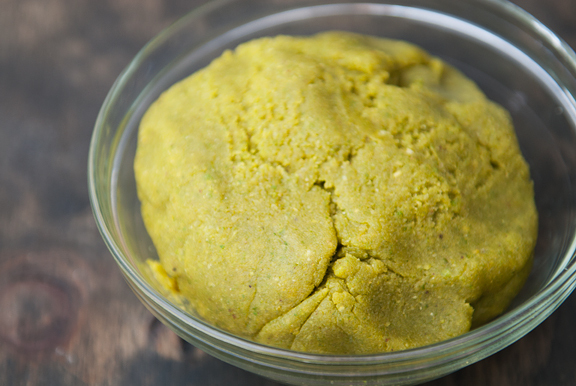 If you can purchase Love’n Bake’s pistachio paste, that will save you quite a handsome chunk of time. You don’t have to blanch the pistachios, but I find removal of the skins helps to preserve the delicate green color of the nuts and blanching is the easiest way to do this. Also, use raw unsalted pistachios because those will give you the truest pistachio flavor. One batch makes quite a lot of paste which you can refrigerate or freeze for later. The cake recipe only calls for a half cup of the pistachio paste. 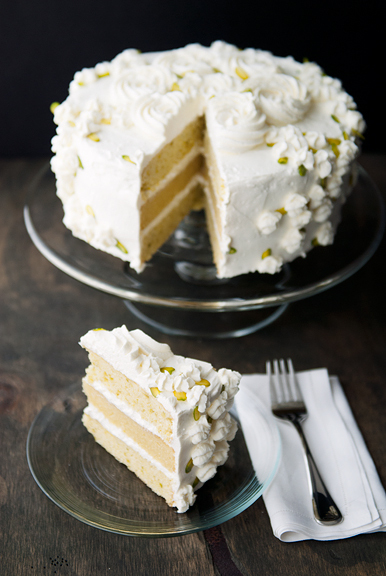 The pistachio cake recipe makes two 9-inch cakes. These are not light, fluffy, airy, spongy cakes. Rather, they are closer in density to a quick bread which makes sense considering all of the nut paste and ground nuts. My cakes always cave a little bit (or a lot) in the center because of my altitude. However, as long as I can cut an even 3/4-inch layer from each cake, that’s all I need. The rest of the trimmings make for great snacking. For the almond cake, I planned on only one layer sandwiched between the two pistachio cake layers. I wanted an almond cake that was similar in density to the pistachio cakes to avoid any structural instability. This makes a somewhat tall 9-inch layer cake (about 2.5-inches tall at the highest point), but the center cratered quite a bit (again, it’s my elevation) such that I could get at most a 1-inch layer from the cake. I cut it to 3/4-inch to match the other two cake layers. The cake on its own is fantastic. Considering how delicate whipped cream is, I knew there was no way to use regular whipped cream between such heavy layers of cake. It would just squeeze out the sides. I had read about stabilized whipped cream frosting and decided to go with a simple method that uses gelatin to increase the strength of the frosting. Not only was it pretty straightforward to make, but it held up perfectly. H’okay! With all of the parts made, assembly is quick. I always slice even cake layers when I make layer cakes for several reasons: 1) I get a lot of cratering at my elevation 2) even layers make for much prettier cakes 3) you use a lot less frosting if you don’t have to fill in gaps (be they in the center or on the edges) and 4) I’m OCD and I have standards. 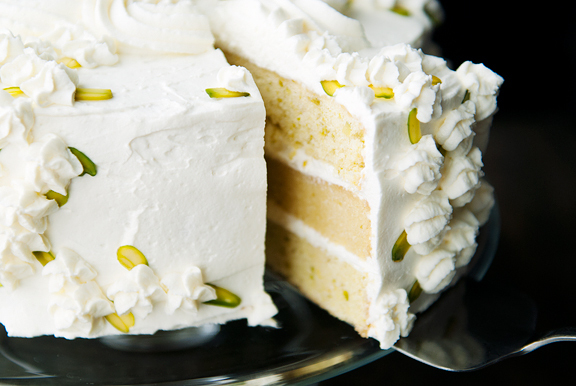 The basic order of the cake is pistachio cake, whipped cream, almond cake, whipped cream, pistachio cake. Spread a crumb coat around the sides and then a final layer of whipped cream frosting over the crumb coat and on the top to make the entire cake white. Decorate the cake however you like: pistachios (chopped, sliced, whole), more whipped cream frosting, fresh berries or other fruit, chocolate shavings or curls or decorations, candied violets, fresh (non-poisonous, please) flowers, sprinkles, etc. 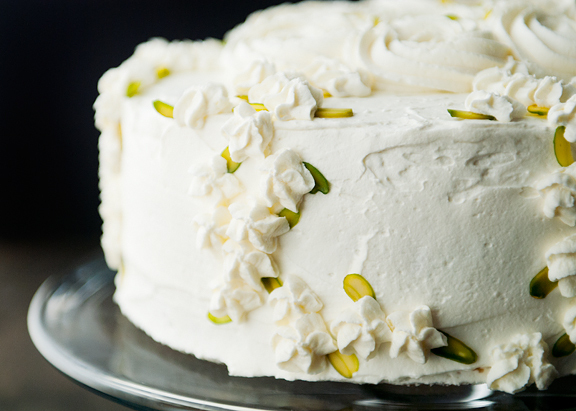 I kept mine simple, piping whipped cream frosting and adding slices of pistachios here and there. It was more like a garden theme. It’s spring. Stuff is blooming. The cake weighs a metric ton. You can probably work your biceps just lifting a bite from your plate to your mouth. As I mentioned before, the cake layers are dense, so the whipped cream frosting is a nice light balance to the cakes. And because the cake layers are dense, they retain moisture quite well – so perhaps a soaking syrup isn’t necessary. Overall, you get a slice of cake with good weight, great buttery and nutty flavors, and an airy whipped cream frosting that doesn’t weep or break down after 3 days in the refrigerator. What a nice thing to make for your mom! doesn’t mom deserve the best? Boil a quart of water in a medium saucepan. Add the pistachios and boil for 3-4 minutes. Drain and remove the skins (most should come right off). 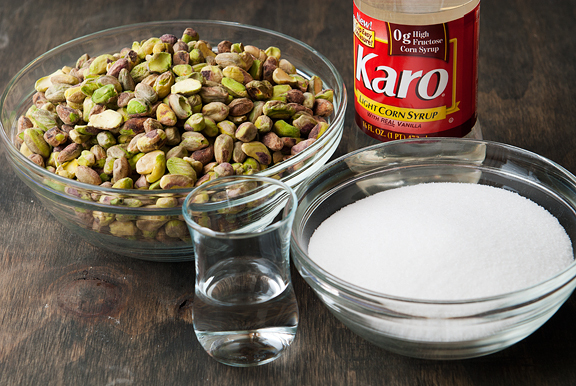 This can be a time-consuming step if you have a lot of pistachios, so give yourself plenty of time. 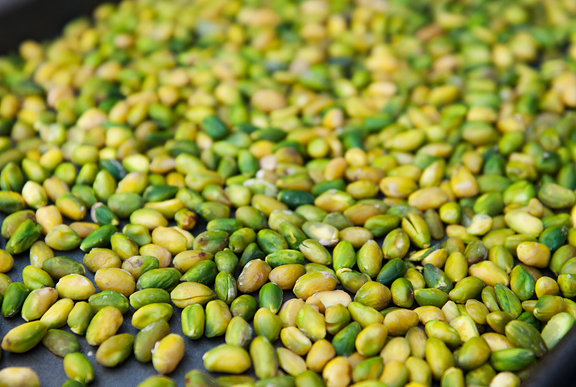 Spread the skinned pistachios on a baking sheet and let dry or place in a very low oven (100°C or 225°F) for 10-15 minutes – but don’t let the pistachios brown or the flavor will be altered. 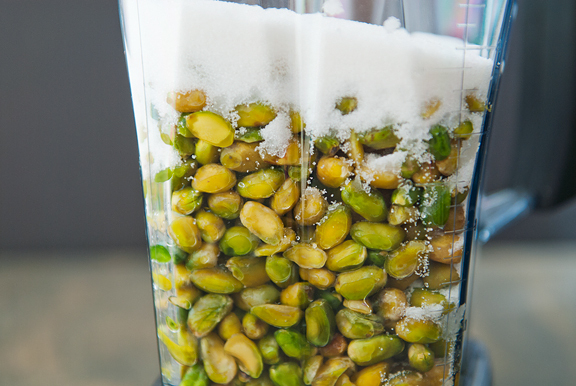 Place the pistachios, sugar, corn syrup, and water in a food processor and blitz until smooth. 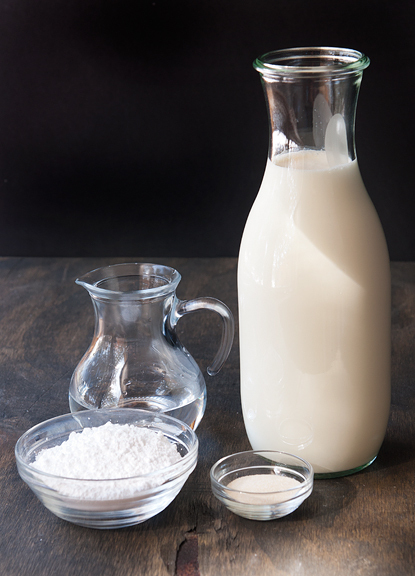 Store in an airtight container in the refrigerator for a month or the freezer for longer. Makes about 3-4 cups. Preheat oven to 350°F. 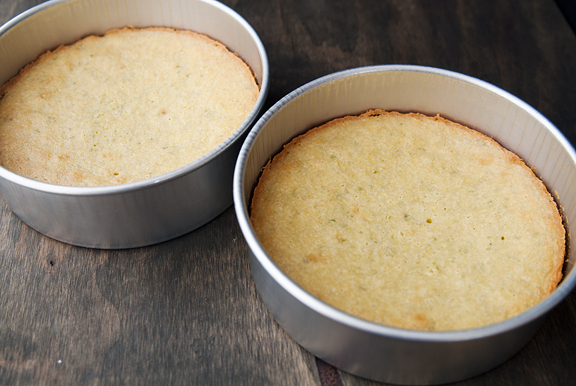 Butter two 9×2-inch round baking pans. Line the bottoms with parchment and butter the parchment. 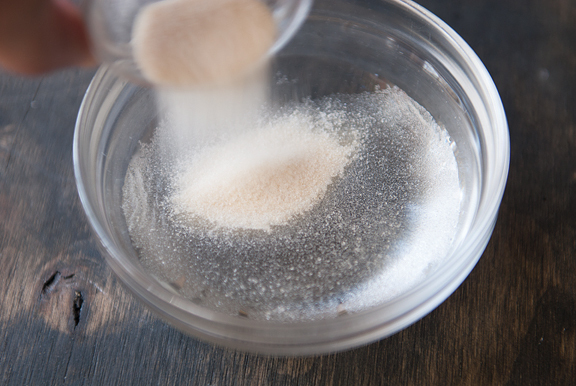 Sift the flour, baking powder, and salt together in a medium bowl. Set aside. 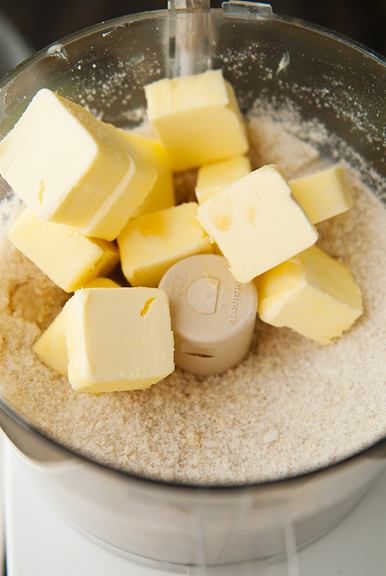 In the bowl of a stand mixer, cream the butter for 2 minutes on medium speed with the paddle attachment. Add the sugar and beat until light and fluffy. Beat in the eggs one at a time, beating well after each addition until blended. Add the vanilla and beat until incorporated. Slowly beat in half of the dry ingredients, then half of the sour cream, then the remaining half of the dry ingredients, and then the rest of the sour cream. 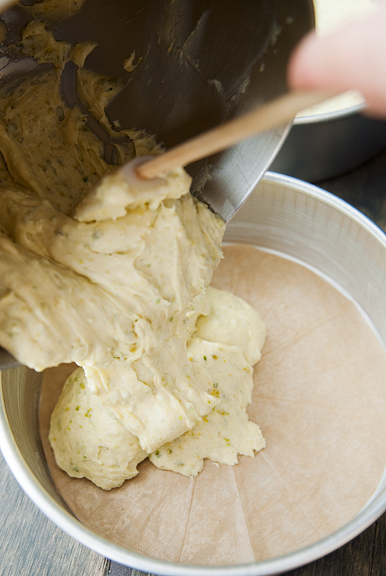 Stir the pistachio paste and pistachio nuts into the batter until just blended. Pour half the batter into each of the two baking pans. Bake for 30-40 minutes (start checking at 30, mine took 40 minutes) until a toothpick inserted in the center comes out clean. Let cool for 10 minutes and then remove from pan. Remove the parchment from the base of the cakes. Oven 325°F. 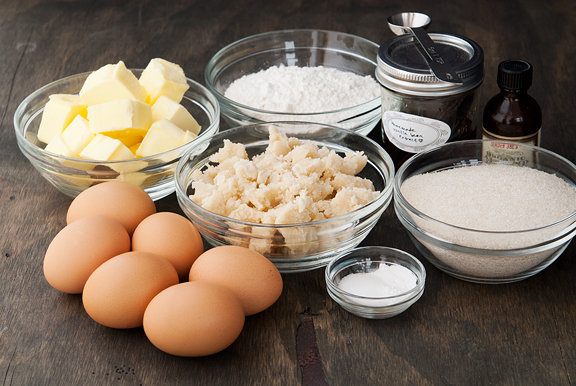 Butter, parchment, and butter a 9×3-inch round baking pan. 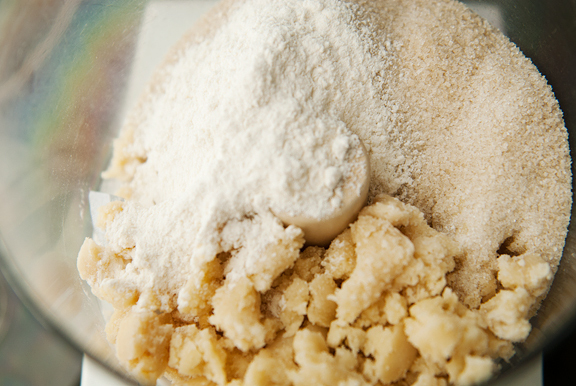 Grind the sugar, almond paste, and 1/4 cup of flour in a food processor until it resembles sand. 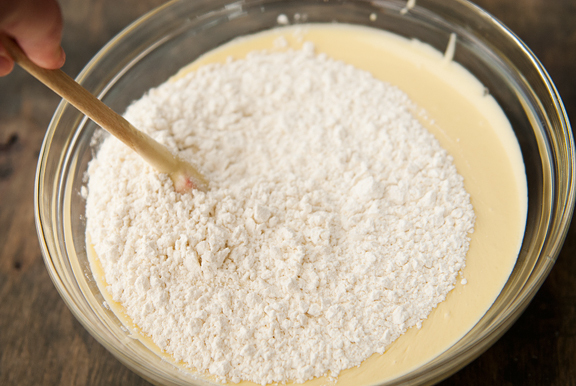 Whisk the remaining 3/4 cup of flour, baking powder, and salt together in a bowl. Set aside. 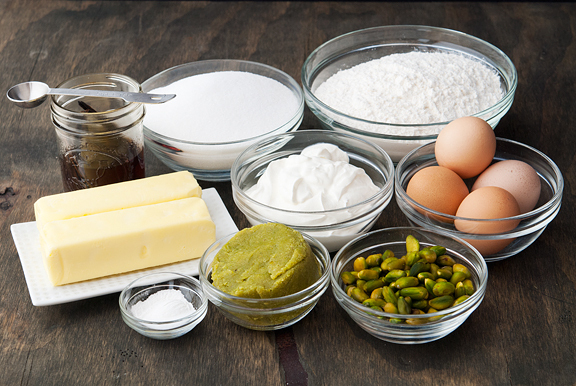 Add the butter, vanilla extract, and almond extract to the almond paste mixture in the food processor and blend until smooth and fluffy. 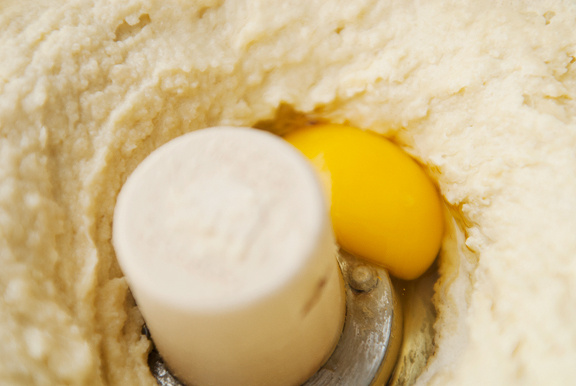 Add the eggs to the batter, one at a time, pulsing to incorporate after each addition. Scrape the sides of the bowl down as necessary. Add half of the flour mixture and pulse until combined. Add the rest of the flour mixture and stir until just combined. 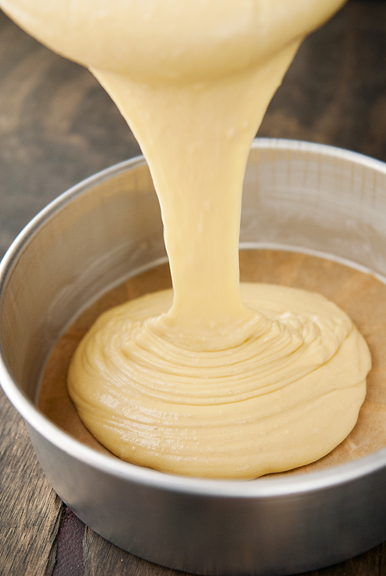 Pour the batter into the cake pan and bake 55-65 minutes or until the top is deep brown and the center is set. Let the cake cool completely before removing it from the pan. 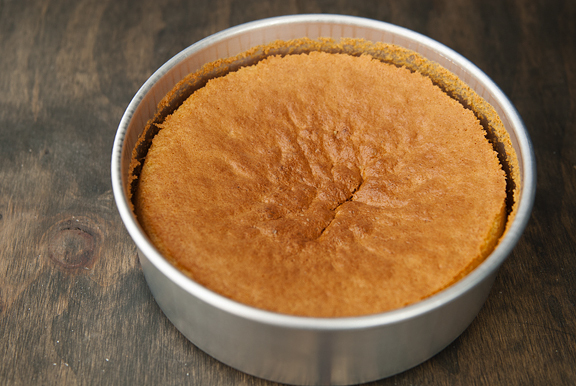 If it sticks to the bottom, hold the pan over a burner for a few seconds and the cake should release when inverted. Sprinkle the gelatin over the cold water in a small bowl. Scald 1/2 cup cream (bring it to a boil then remove immediately) and pour it over the gelatin. Stir until the gelatin is dissolved into the cream. 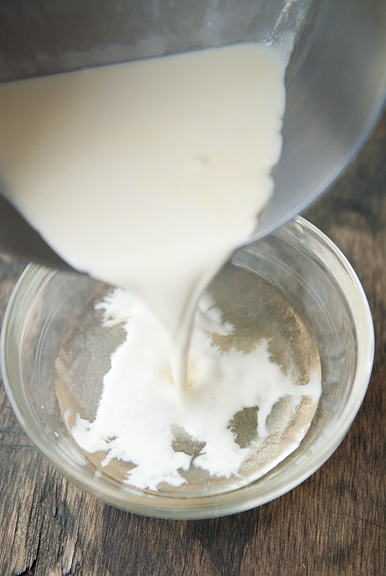 Refrigerate the gelatin for 10-15 minutes until it reaches the consistency of egg whites. 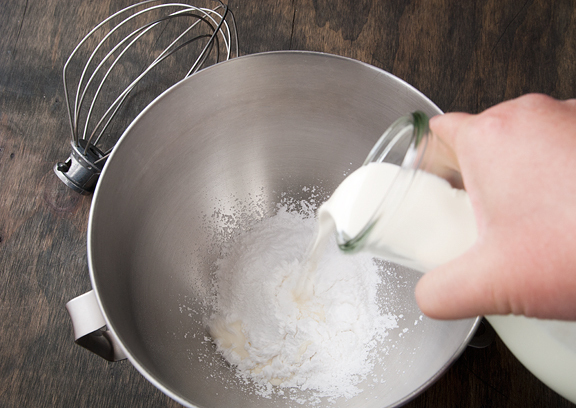 Whisk until it is smooth. 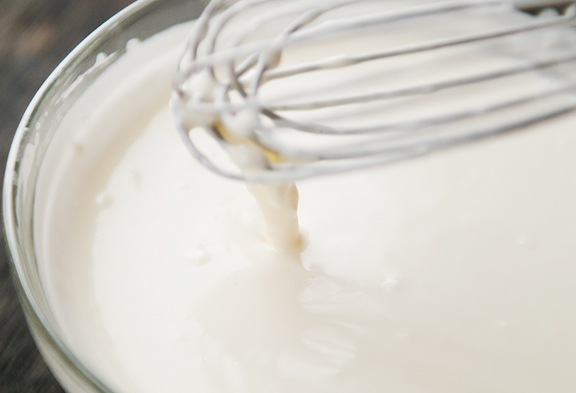 Place the remaining whipped cream and confectioners sugar in a mixing bowl and whip until soft peaks (don’t overwhip because you will have to whip in the gelatin). Add the gelatin to the whipped cream and whip for another 10-20 seconds until medium peaks. Assembly: With a serrated knife, trim each of the cake layers to the same height (mine were 3/4-inch). Set the trimmings aside for snacking. Place a pistachio cake layer, bottom side down, on the serving plate. 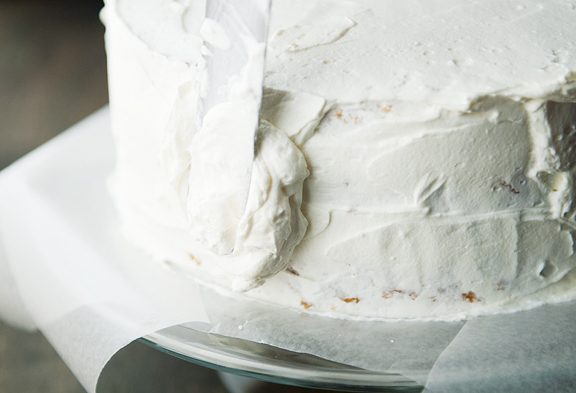 Line the edges of the cake with strips of wax paper by tucking each strip just under the edge of the cake. Spread a cup or more of the whipped cream frosting over the cake layer. Set the almond cake layer on the whipped cream frosting. Spread another cup or more of the frosting over the almond cake. Repeat with the last pistachio cake layer (bottom side up). Crumb coat the edge of the cake by spreading a thin layer of frosting all around the sides to seal any gaps and lock down any crumbs. Frost the sides and top of the cake with more whipped cream frosting. Decorate as desired. Refrigerate the cake. Serves 12-16. Absolutely beautiful cake! And getting the skins off the pistachio’s is definitely time consuming…whew! LOVE this cake! 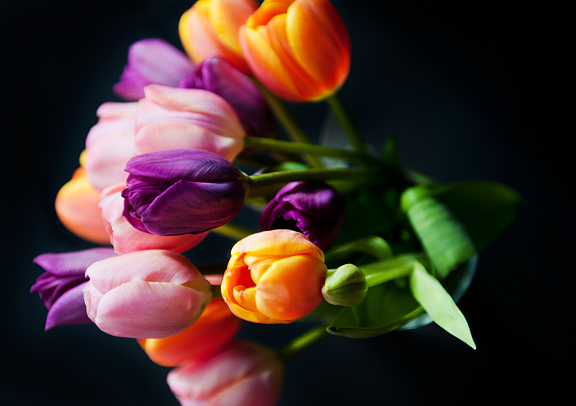 Perfect for Mother’s Day….or any time of year! What a delicious way to be OCD! I love the cake but I think I needed your mom’s advice on retirement accounts a long time ago! 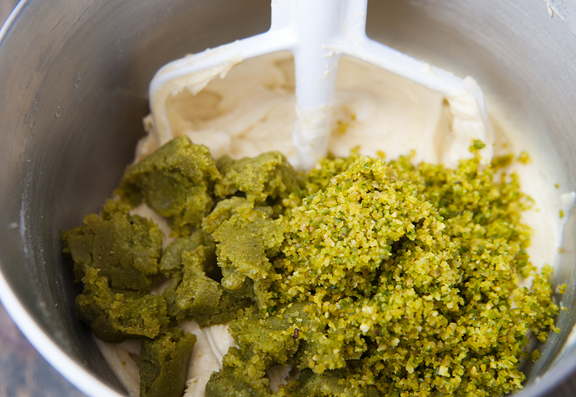 I could eat that bowl of pistachio paste pretty much all by itself…. “Smell-O-Vision’ sensors went off like crazy. Fire and rescue showed up and I had to promise I’d call Emeril for advice. Mother’s Day? I used to think of it with my own mama, and I tried to treat her to flowers. She’s no longer with me, here on earth, that is, but that doesn’t mean I don’t think of her on each, and every, mother’s day. Now, the MIL is a different story. She is content to complain about whatever idea I happen to come up with, so about five years ago I handed that challenge gracefully back to the hubs. He buys the card, sends me for the gift and we go on pretending that all is well because I kept my hands out of the delivery. (Only he signs the card and hands off the gift.) I know this sounds melodramatic, but it is my stress-free solution for the woman who wishes her oldest had married a creature from Earth, rather than the girl he picked up on Mars. That cake, oh my lord. I may have to make it for myself, but some day I will do it. I love the photo of Kaweah creeping. It’s understandable. Hey, have you read Alexandra Horowitz’s Inside of a Dog? I just read it because I’m getting a puppy. It’s a neat evidence-based (but written for popular audience) book about how dogs may experience the world. Holy moly! That’s the most delectable cake I’ve ogled at (online) in quite awhile! Now that is SOME cake!!! 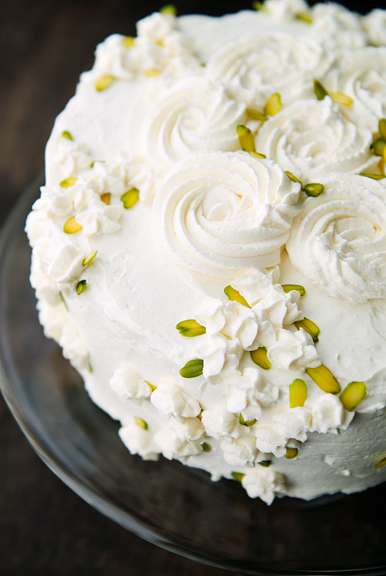 It’s gorgeous and beautifully designed with each pistachio pieces. I love pistachios! 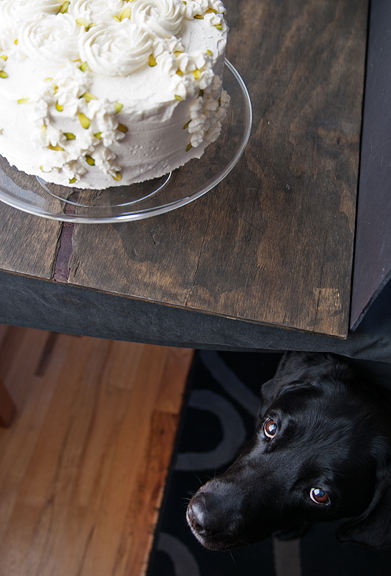 Dogs know when there is good food waiting to be dropped on the floor. Tonight I made the strawberry frozen yogurt, and my husband loves it. Oh my. My mouth is watering! (And my MIL is getting Hellimae’s caramels, too. Mom got them for Valentine’s Day). Your superb photos & clear instructions give even beginning bakers confidence to make this wonderful cake!! For those of us who avoid corn, do you think light agave syrup would be a comparable substitute for the corn syrup? Jen, this cake is fabulous! Like you, I am a true pistachio lover for as long as I can remember. This cake conjures up memories of trips to Baskin Robbins to get Pistachio Almond ice cream with my grandfather. Besides Cherry Vanilla, Pistachio Almond was his fave. My birthday is coming up soon and I would love to make it this year. One question. Where did you purchase your unsalted pistachios? I have had the darndest time finding them unsalted. Can you let me know where you got yours? Thanks! Jen this cake looks awesome, Pistachio is my absolute fav! Good goin! Thanks for the recipe! 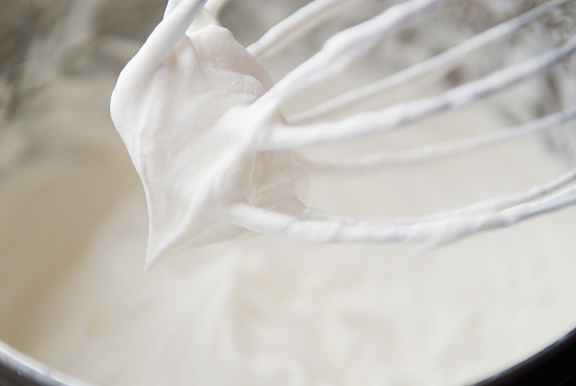 I so need a trusty stable whipped cream frosting! debbie – tell me about it! Janet – ha ha ha ha! Rocky Mountain Woman – I know, right?! I LOVE pistachios! L – I’ll have to check that book out – thanks! Jane - I'm sure any kind of invert sugar would work since it's such a small amount. Liz - oh, I buy them in bulk from Whole Foods (their bulk section). They usually have different kinds (salted, roasted, raw, etc.) If you're lucky enough to have a Trader Joe's, then try them (because they'll be cheaper) or maybe even Costco will have some? Mrs. Ergül - yeah, I'm glad this one works because I think I'll use it for more of the summery cakes where a buttercream is too heavy (and melty). Thanks for the mention. 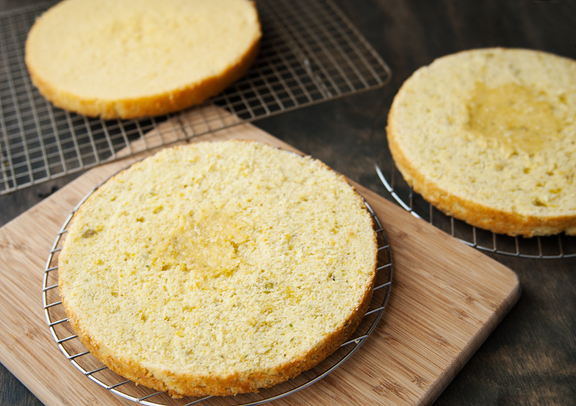 Love the idea of using David Lebowitz’ almond cake recipe for one layer. I might try lightening the cakes by separating the eggs then folding in the whipped whites at the end. It might help. Then again you cake looks positively fit for a queen, a Mom that is. I made this cake (all pistachio layers) for my boyfriend’s bday. It was a hit! People still talk about it a year after! Thank you for the inspiration! Looking forward to trying a new recipe this year. Katya – yes, but I’m not sure if I would add melted chocolate to the batter or cocoa powder in place of some of the flour. Give it a try and see? Think we could use chocolate ganache for the frosting instead of the white frosting? Farha – I’m sure you could, just make sure it’s easy to spread or else it might be tough on the cake when frosting it.